Current rectenna designs work best at lower frequencies. Yet waste heat from hot objects can push into the 100 THz (100 trillion cycles per second) range. 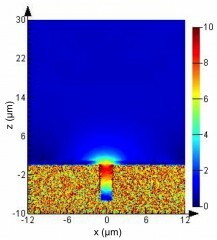 Park and his colleagues found a way to enhance thermal emission of hot bodies at the lower end of the spectrum (around 1 THz) by manipulating the surface of the object. Park’s team uses software to analyze how the nanoscale topology of a surface — its bumps, holes or grooves — changes the way that electromagnetic radiation interacts with the surface. In some instances the geometry supports the formation of a wave of rippling electronic charges, called a plasmon, that hugs the surface. 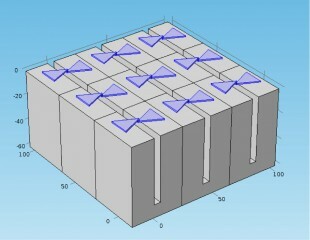 The researchers also used computer modeling to design a bowtie-shaped antenna that would effectively capture the enhanced thermal emission. Simulations predict that an antenna placed near the holey surface could capture 10,000 to 100,000 times more thermal energy than an antenna in open space. The team is in the process of experimentally testing this prediction and hopes to have new results to report soon. The results will also help the team calculate how rectenna thermal energy harvesting might compare to other ways of harvesting waste heat, such as thermoelectric materials.